Wondering about the best natural ways to lose belly fat for good? First, let’s get realistic. The truth is that you can’t simply spot-reduce belly fat or do hundreds of crunches to make it go away. Belly fat is more closely tied with the lifestyle choices you make everyday. And this is actually a good thing. You can sidestep all of those myths about quick six pack abs and start doing things that will actually work long-term. In fact, everyone has at least a little belly fat. But too much can increase your chances of illness and disease. Did you know that generally 75% of weight loss is about the nutrition you put in your body? You can make huge progress reducing extra belly fat by eating a healthier diet. That means cutting down on the processed foods you eat and replacing more of them with whole foods. Think fresh fruits and veggies, whole grains, lean proteins, and healthy fats. And don’t forget to incorporate a high-quality supplement like fulvic acid in Mimi’s Miracle Minerals to make sure you get all of the nutrition you need — even from a healthy diet. Try these techniques for helping yourself relax more and handle the stressful events in your life. Since stress can often lead to emotional eating or grabbing more fast food when you’re overwhelmed, helping yourself stay calm amongst stressful events helps you learn better ways to cope and work on better time management. Consistently not getting enough sleep can increase your levels of visceral fat, which is the fat that expands on your belly and produces inflammatory substances and stress hormones, affecting insulin production. You want to avoid this type of fat since it can lead to large health problems. Try to get eight hours of sleep a night. If you’re currently getting far below that, you can start working your way up to eight by going to bed 15 minutes earlier each night. If you aren’t sure where to start, you can search for any of these exercises online for instructions on how to do them. Incorporating both cardio exercises and resistance exercises is a great way to ensure the best workout for belly fat loss. 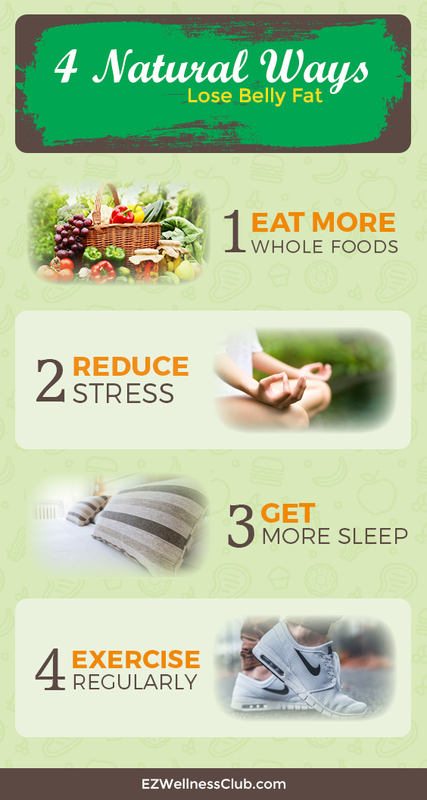 The best way to reduce belly fat is by doing it healthfully and naturally. Follow these tips for natural ways to lose belly fat and you’ll be sure to see results!